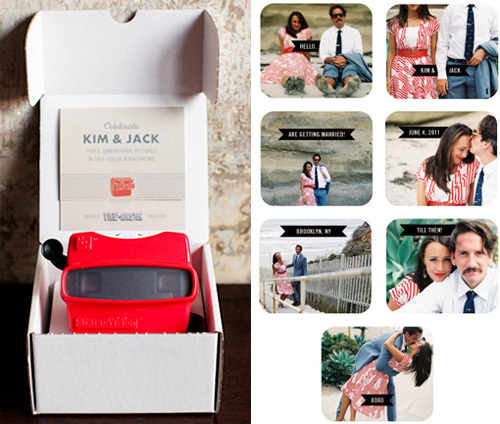 Custom Viewmaster Wedding Invites | OhGizmo! Capitalizing on the latest trend of anything and everything being in 3D, as well as incorporating a bit of retro charm, these custom-made View-Master wedding invites will make it hard for anyone to turn down attending your big day. Created by Brooklyn, New York-based Mélangerie, you simply have to send along 7 high-res images you want to use, including a brief description of each, and they’ll create a custom View-Master slide you can include in this one-of-a-kind invite. Well, one-of-a-kind as long as you’re the first of your friends to go with this idea. The invites take about 6 to 8 weeks to make and ship to you, and once they arrive you’re responsible for assembling them and mailing them out to your guests. So the whole idea is going to be a bit on the expensive side. Mailing out a box with a View-Master inside is certainly going to cost a bit more than a paper envelope. And the invites themselves run $3,450 for 100 guests.